TL; DR: From its early years shipping software via ROM chips to contemporary cloud SaaS deployments, Xara has been innovating design-centered software for nearly four decades. The secret to this longevity, as Founder Charles Moir told us, has been to keep an ear to the ground to discover emerging industry trends that can lead to customer success. Xara has developed a wide variety of software for an array of use cases since its inception in 1981, including its most recent suite of tools that zero in on web design and development. But the company’s focus has always remained on building the solutions designers need to construct compelling and useful creations for their clients. From today’s perspective, 1980s technology may seem crude and primitive. However, long before smartphones or even the internet, the ‘80s were actually a time of great software innovation. In fact, some of today’s biggest names in software emerged in the wake of 1977’s immensely popular Apple II computer. In 1981, MS-DOS hit the scene, and Adobe Systems, Autodesk, Intuit, and the multi-platform developer Xara were launched soon after. While Microsoft and Apple stuck to developing software for their own systems, others focused on building cross-platform software for use on the wide variety of computers available at the time. Xara, operating out of the UK, began releasing software for virtually every system on the market, including Atari, Acorn, Linux, and Windows. In 1987, the company released Artworks for the Acorn Archimedes, which would later evolve into Xara Studio, the predecessor to its modern website design suite. Xara Founder Charles Moir told us the company has been innovating design software for nearly four decades. Following a brief stint as an ISP in the mid-1990s, Xara began writing software for Windows 95. While partnering with Microsoft and Corel, the company released Xara Studio in 1994, which has subsequently been rebranded several times, with its current iteration named Xara Designer Pro X. Given Xara’s special focus on web design, its tools have been developed specifically with users in mind. Sporting a clean, aesthetically pleasing GUI, Xara Designer Pro X helps designers create anything from event fliers to stunning websites. Back when Xara got started in web design, the web mainly consisted of plain-looking sites due to the limitations of early HTML. Furthermore, designing a website in the early days of the internet was a matter of writing complex code, similar to software programming. To grow their presence beyond the brick-and-mortar buildings and onto the web, enterprises hired web development teams and other IT professionals to handle the technical work. Meanwhile, small businesses were left to either learn HTML or budget their design teams cautiously. Fortunately, Xara would rise to the occasion with design software suited for a much broader user base. By simplifying the technical aspect of design, Xara makes it possible for anyone to create beautiful websites without HTML skills. Centered on visual presentation, Xara’s software offerings include a number of site builders, as well as graphic and document editors. Not only has Xara made web design more accessible, but the company has also consistently improved its tools over time. With the widespread popularity of smartphones and tablets, modern websites must be designed in a dynamic way, allowing them to correctly display on a wide range of screen sizes. The most intuitive way to achieve this is through responsive design — that allows for flexible rendering and adaptable layouts. With responsive design, page elements are sized and positioned differently for different device screen widths. “It’s really one website; when you’re editing text, you’re editing it in all versions,” Charles said. With Xara’s design tools, users can create professional-grade sites with optimal cross-device usability. For businesses looking to reach the widest audience possible, responsive design can make all the difference. Poorly rendered sites will not only appear to be broken but could very well be rendered unusable. Thus, potential mobile customers may decide to forego a sign-up or sale entirely. Xara Design Pro — along with its online equivalent, Xara Online Designer — handles this process automatically, using a single line of HTML code that gets inserted upon publication. In addition to responsive layouts, Xara continues to incorporate the latest web design features, such as parallax scrolling and printer-friendly design, into its products. Charles told us that when creating print documents, like PDF, you don’t need to understand the PDF scripting language (most people aren’t even aware of it). Print and PDF design are done entirely visually. “Website creation should be like that,” he said. While Xara’s main mission is to make web design accessible for everyone, it also realizes many users want a unique site and are willing to tweak existing design features to achieve their exact vision. Although the template-based approach works well for most users, customization options are limited, prompting some users to opt for a more flexible alternative. 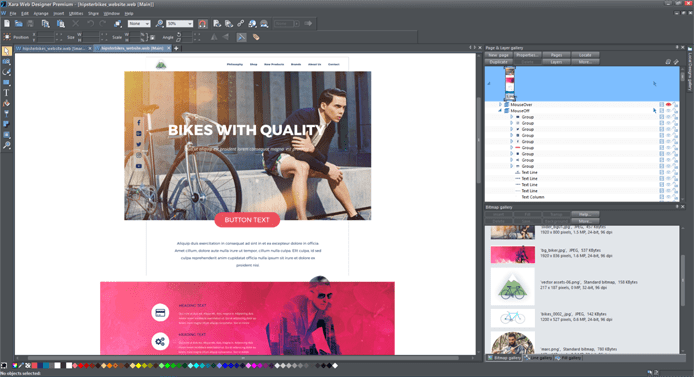 With Xara Designer Pro, these creative pros are able to do just that — build unique websites from scratch with text, graphics, and drawings. Xara’s template-based approach to site creation allows visualization of the end product, resulting in compelling design. Xara’s from-scratch design capabilities highlight the company’s goal to hide the technical aspects of many design processes. In recent years, the rise of Ultra HD, 4K, and Retina displays has allowed people to view images clearer than ever before. Using Xara Designer Pro, site owners can set a high-res image to display dynamically with respect to a user’s screen resolution, similar to how responsive design adjusts the general layout. Given its extensive experience with both web designers and software development, Xara is quite familiar with the potentially frustrating technical underpinnings involved in running a website. As a result, Xara’s tools are designed to take the headaches, technical difficulties, and guesswork out of web design. Xara also learns about trends by openly communicating with customers, often conducting interviews with them. This transparency and the desire to make the user’s job easier have been keeping Xara going strong for more than 35 years. Nearing its fourth decade of operation, Xara has witnessed and embraced many new tech trends in an attempt to further empower site owners. 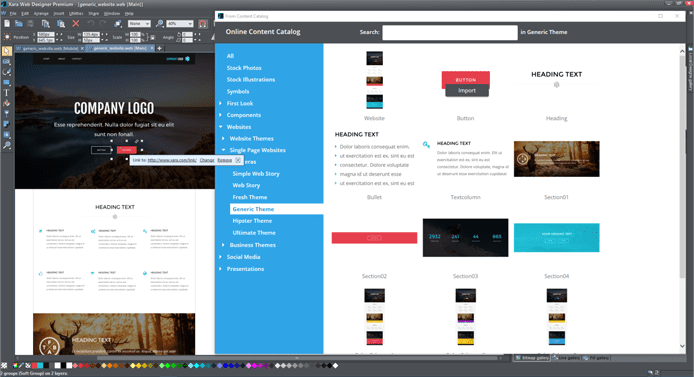 Similar to Xara’s original multi-platform software, its web design tools bring new possibilities to a wider range of people. In fact, Xara’s Online Designer is accessible from any device that has a web browser. “You can build whatever you want, as complex as you want, without constraint,” Charles said. By opening up the extensive possibilities of web design to a broader audience, Xara helps make the web a more beautiful place to browse and do business.